Katerra said the financing will be used to fund its continued manufacturing expansion and for further investment in its R&D efforts. 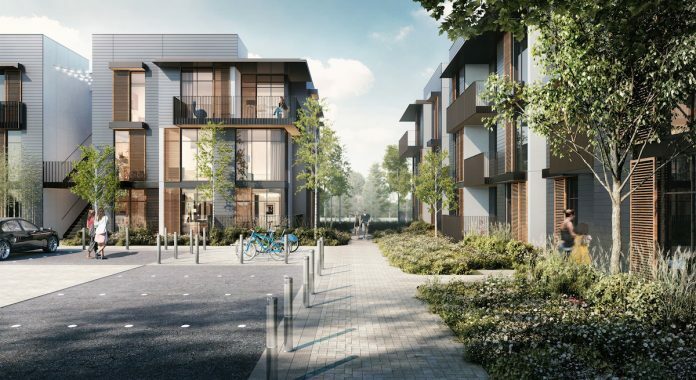 Softbank Vision Fund is leading a group of investors in backing the $865-million Series D funding in high-tech construction startup Katerra, the two-year-old Silicon Valley firm said in a press statement. New investors in the round include: Canada Pension Plan Investment Board (CPPIB), a private investment fund managed by Soros Fund Management LLC, Tavistock Group, Navitas Capital, DivcoWest, and others. Michael Marks, chairman and co-founder of Katerra, said the $12 trillion construction industry is ripe for digital disruption. “Katerra leverages its own software platform to remove time and costs from building development and construction. This new round of funding will enable us to further invest in R&D and continue to scale the business,” Marks said. Founded in 2015, Katerra managed to accumulate more than $1.3 billion in bookings for new construction, spanning the multi-family, student and senior housing, and hospitality sectors. The company also amassed a global team of more than 1,300 people, attracting senior leadership and talent from groundbreaking technology brands such as Apple, Google, HP, Nokia, Sandisk, and Flextronics. Customers, who are residential and commercial real estate developers, use Katerra when they want to get buildings finished quickly. Katerra appeals to customers who don’t want to work with a bunch of disconnected teams, like one manufacturer for cabinets, another for windows, another installer for elevators, and LEED-certified HVAC systems. In connection with the investment in Katerra, Jeffrey Housenbold of SoftBank Investment Advisers will join Katerra’s board of directors.